More and more cities are going digital and providing services to their communities online. One of those services at times can be a searchable database for cemeteries. The Official City of Niagara Falls Canada has such a site for those researching their ancestors from the Niagara Falls Canada area. The database contains 23 different cemeteries that have been transcribed and are available for searching. The database also includes pictures of each of the tombstones that are clear and easily read. The website is user friendly requiring you to just put in the first and last name in order to search the databases. I have no ancestors from Canada so I tried searching with just the first two letters of a surname and the search engine pulled up many possibilities. If you are interested in researching in this area for death and burial information this site would be one that I would search. 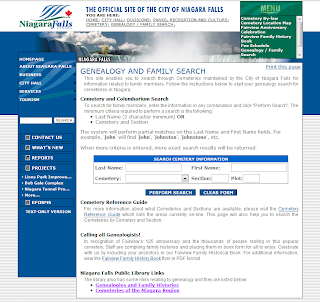 If you would like to browse or search this site clickCity of Niagara Falls Canada Genealogy and Family Search. Have fun!